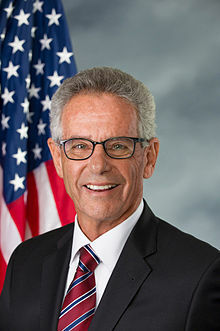 Alan Stuart Lowenthal /ˈloʊənˌθɔːl/ (born March 8, 1941) is an American politician who has been the United States Representative for California's 47th congressional district since 2013. A member of the Democratic Party, he previously served in the California State Assembly from 1998 to 2004, representing the 54th Assembly district, and then as a member of the California State Senate, representing the 27th district from 2004 to 2012. In both posts, he represented the city of Long Beach and its surrounding suburbs. Lowenthal was born and raised in Queens, New York City. His family is Jewish. He graduated with a B.A. from Hobart College and earned a Ph.D. from Ohio State University. In 1969, Lowenthal moved to Long Beach and became a professor of community psychology at California State University, Long Beach. He went on leave to become a Long Beach City Councilman in 1992. He remained on leave for several years until retiring in 1998. In 1998, Lowenthal decided to run for the 54th district of the California State Assembly. He defeated Republican nominee Julie Alban 50%-47%. In 2000, he won re-election to a second term defeating Republican nominee Rudy Svorinich, a Los Angeles City Council member, 59%-39%. In 2002, he won re-election to a third term defeating Republican nominee Cesar Castellanos, 60%-40%. In the Assembly, Lowenthal authored gun control in California that would ban gun selling in people's homes. He was also a founding member of the Assembly's Bipartisan Caucus and authored legislation for the creation of California’s first ever Bipartisan Citizens Redistricting Commission. Senator Lowenthal was named Legislator of the Year by the California Firefighters Association in 2002 after he passed a law that limited liability for organizations that donated firefighting equipment. The League of California Cities named him Legislator of the Year in 2001 due to his advocacy on behalf of local governments. He has also received the "Rivie" Award from the Friends of the Los Angeles River due to his efforts to help clean up the troubled river. In 2004, he decided to run for the California Senate in the 27th Senate district. He won the Democratic primary unopposed. In the general election, he defeated Republican nominee Cesar Navarro Castellanos 63%-37%. In 2008, he won re-election to a second term, defeating Allen Wood 67%-33%. The 47th District includes the Los Angeles County communities of Avalon, Long Beach, Signal Hill, Lakewood, Cerritos, Artesia, Bellflower, Downey, South Gate, Lynwood, Paramount, Hawaiian Gardens, Florence-Graham and Willowbrook. Other legislation that Senator Lowenthal has had signed into law include a law to reduce diesel emissions at the ports by limiting idling time for trucks conducting transactions at the ports, a bill that established a grant program to provide financial incentives for purchasing or leasing electric vehicles, and a bill to protect highways. With Bonnie Lowenthal's election to the Assembly and Alan Lowenthal's reelection in 2008, Senator and Assemblywoman Lowenthal were the first divorced husband and wife to serve concurrently in the California State Legislature. Lowenthal provided significant commentary throughout the documentary Who Killed the Electric Car?. On November 6, 2012, Lowenthal was elected to the U.S. House of Representatives from the newly created 47th District after defeating Republican Gary DeLong. Although DeLong carried the Orange County portion of the district with 54 percent of the vote, Lowenthal swamped him in the Los Angeles County portion by over 38,000 votes, more than the actual margin of 30,100 votes. He took office on January 3, 2013. He is the first non-Hispanic Democrat to represent a significant portion of traditionally heavily Republican Orange County in Congress since Jerry M. Patterson, who served from 1975 to 1985. In much of the Orange County portion of the district, he is the only elected white Democrat above the county level. However, the Los Angeles County portion has more than double the population of the Orange County portion. Lowenthal was reelected in 2014 by a similar margin. Lowenthal has been critical of Brazil's president Jair Bolsonaro. In March 2019 he and 29 other Democratic lawmakers wrote a letter to Secretary of State Mike Pompeo that read in part, "Since the election of far-right candidate Jair Bolsonaro as president, we have been particularly alarmed by the threat Bolsonaro’s agenda poses to the LGBTQ+ community and other minority communities, women, labor activists, and political dissidents in Brazil." He is married to Deborah Malumed, MD. His son Daniel is an elected judge to the Los Angeles County Superior Court. ^ Saltzgaver, Harry. "Lowenthal To Represent Long Beach In Congress". gazettes.com. Retrieved 7 November 2012. ^ "Members". Congressional Progressive Caucus. Archived from the original on 2017-10-22. Retrieved 12 October 2017. ^ "Reps. Susan Wild and Ro Khanna Urge Sec. of State Pompeo to Condemn Human Rights Abuses in Brazil". www.wild.house.gov. ^ "Members". House Baltic Caucus. Retrieved 21 February 2018. ^ "Membership". Congressional Arts Caucus. Retrieved 13 March 2018. ^ "Our Members". U.S. House of Representatives International Conservation Caucus. Retrieved 2 August 2018. ^ "90 Current Climate Solutions Caucus Members". Citizen´s Climate Lobby. Retrieved 18 October 2018. This page was last edited on 14 April 2019, at 12:33 (UTC).